The core values that you've dictated for your business play an important role in just about every decision that you make. What many people fail to realize is that they need to play an important role in your marketing, too. Marketing isn't just about communicating what services you provide or what products you offer, but what type of business you represent. The customer/business relationship is one that is built on trust, and putting your core values on display through marketing is one of the best ways to strengthen that relationship both now and for all time. In many ways, the most important part of marketing has nothing to do with whatever new product you're touting at the time. It's about distilling everything - your products, your services, your employees and more - into a single message that lets the customer know who you are, what you're trying to do, and why you're trying to do it. Consider the message that ends every Visa commercial you've ever seen, the message: "It's everywhere you want to be." This message isn't overly reliant on how shiny the cards are or what perks or rewards you might get for signing up. It's beautifully simple and conveys an important message: by signing up for a Visa card, you've got access to a trusted financial resource anywhere you could possibly need it. You've got a partner that you can depend on, day in and day out. 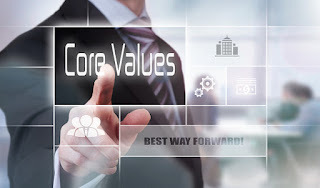 If you've decided that two of the most important core values for your business are honesty and integrity, you need to accept the fact that the best way to display this to your audience will not necessarily always be positive. Consider what happens when you make a mistake as a business owner. Maybe you released a product and said that it did one thing, while it really did another. Maybe you claimed that it did one thing really well, when in reality, it was barely functional and not ready for public consumption. These are the types of mistakes that business owners make on a regular basis - it's a fact of life. The thing that separates the successful business owners from the ones who quickly disappear, however, is what they do next. If you've always told your customers that you value honesty and integrity, the path is clear: you own up to your mistake in your marketing. You acknowledge the problem as a learning opportunity and pledge to take the experience and use it to do better work in the future. It's something that you see time and again. Coca-Cola introduced the stunning disaster that was New Coke in 1985. Microsoft released the Windows 8 operating system. What do these businesses have in common? They're still around, thanks to the fact that they understood that the core values of honesty and integrity sometimes mean humility, too. They admitted that they made mistakes, apologized to their customers, and pledged to do better in the future. Far too many business owners label the core values of their business as "not for public consumption." Now, more than ever, the relationship between a business and its customers is one that is forged from a strong sense of transparency. One of the best ways to show your customers what type of business you are is to let those core values reflect outward with your marketing materials.